VESA compatible for: 100mm x 100mm, 200mm x 100mm, 200mm x 200mm, 400mm x 200mm, 400mm x 300mm, 400mm x 400mm, 600mm x 400mm, 800mm x 200mm, & 800mm x 400mm. These heavy duty TV stands with wheels for portability feature locking casters. 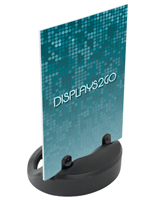 The LCD display is transportable to and from events with ease. Once in a desired location, the casters lock to stabilize the unit. The flat panel racks, heavy duty TV stands with wheels that are height adjustable have a VESA compatible bracket. This mount holds 37" to 60" televisions that weigh up to 176 lbs. 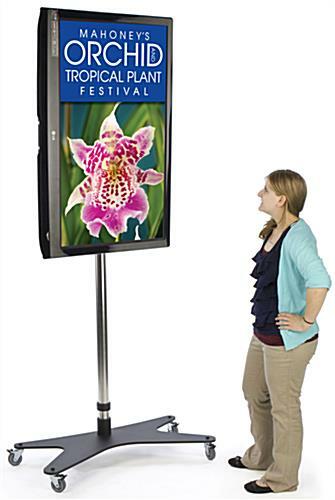 These portable heavy duty TV stands with wheels are designed to mount a monitor in portrait (vertical) orientation only. The long arms of the bracket will be visible if a screen is in landscape (horizontal) orientation. 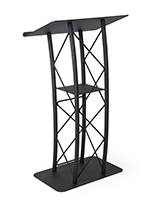 The heavy duty TV stands with wheels that are found at trade shows are a perfect way to promote your business using a flat panel monitor. 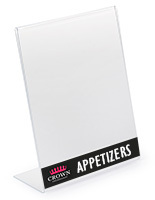 The adjustable bracket allows your screen to be placed at different heights to offer the best display! 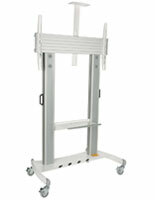 These television mounts, also called plasma racks have casters for transport and mobility from room to room. Heavy duty TV stands with wheels can mount a 50" LCD including brands such as LG. These television brackets, monitor mounts are VESA compatible allowing all brands to be mounted to these dynamic stands. 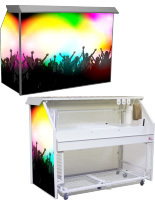 Mounting a 50" LCD to these heavy duty TV stands with wheels makes these units ideal and mostly used at tradeshows, schools, corporate offices, events and many other locations for displaying company information or instructional videos. These LCD mounts, monitor racks have casters for portability and locks for stability and will go with any LED that are 37" to 60" that weighs up to 176 lbs. The astounding weight that can be held makes these heavy duty TV stands with wheels the best option for television displays. 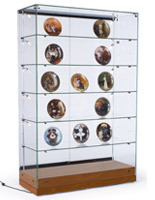 LCD racks, plasma displays, and other heavy duty TV stands with wheels that have steel construction are extremely durable displays. These flat panel racks with casters are built to last for many years, and work especially well in heavily trafficked areas. 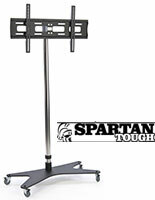 The monitor stand ships unassembled, and includes instructions and tools for quick assembly. This plasma display with casters has a tilting bracket that allows angling of your television to provide the best view. 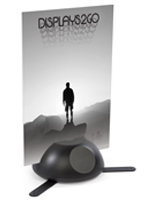 These LCD displays feature a black and chrome finish that brings style to any décor they are placed within. 21.8" x 37.4" x 1.0"